Do you know people who would love to revel in music as well as sing the night away? Well then, invite your potential guests through flyers and posters with an eye-catching and dynamic design that will surely excite your potential guests! 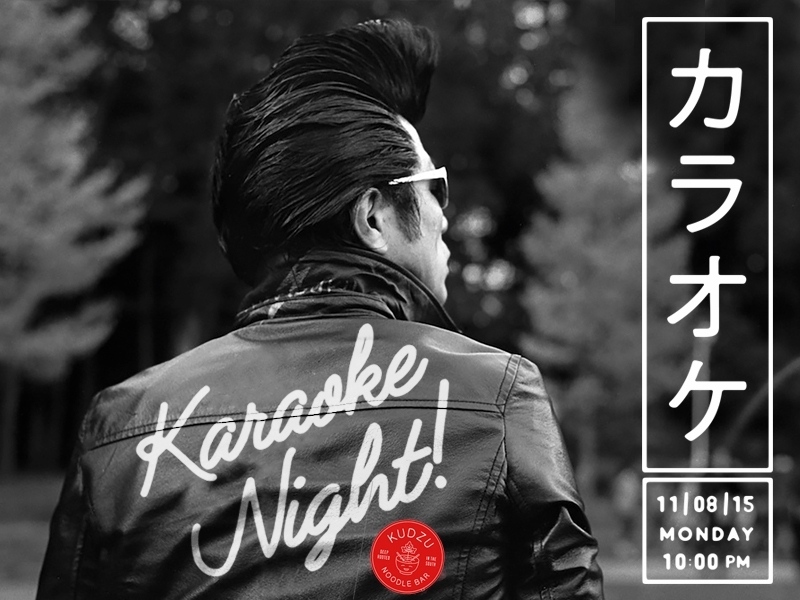 This is an easy and sure way to inform guests about an upcoming karaoke night near them. 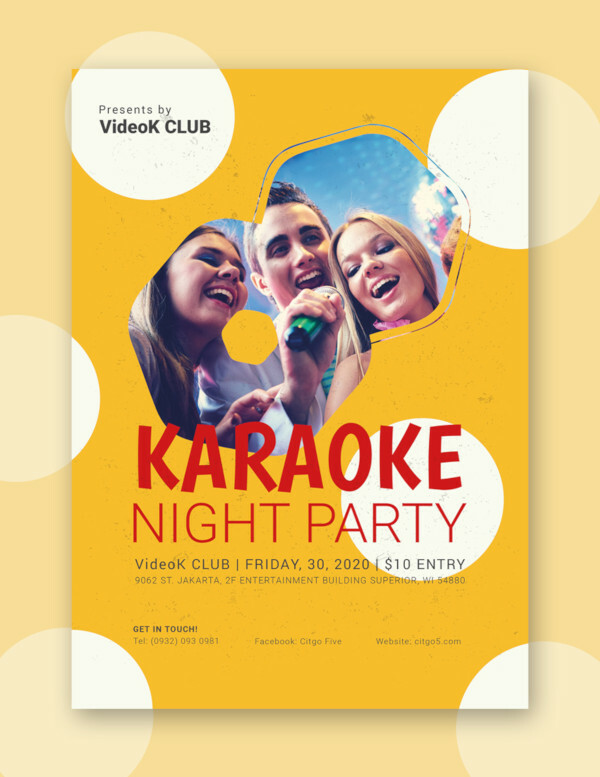 Prepare for your approaching karaoke night with our list of flyers and posters available directly below. If you are looking for flyer designs that you can immediately place all necessary event details, we have gathered ready made and editable samples just for that. 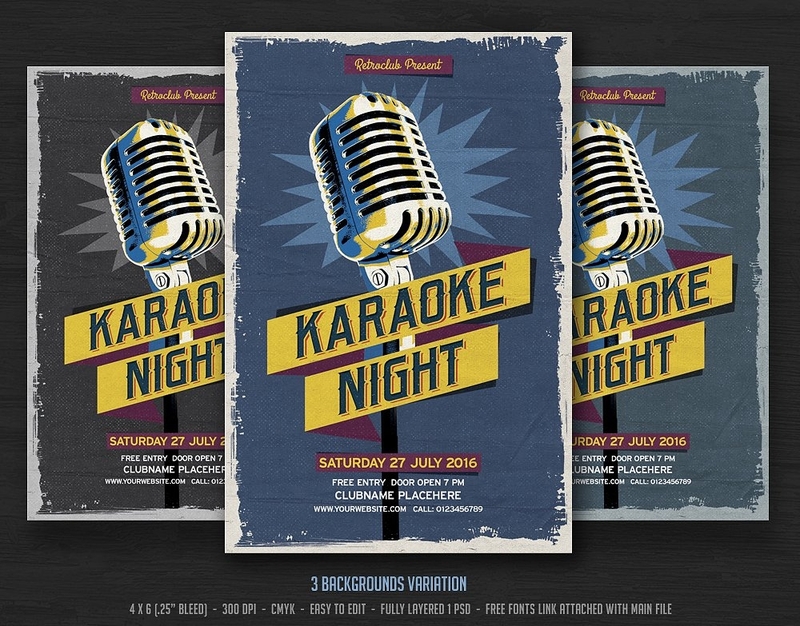 You may go through our list of karaoke party templates ready for your disposal. 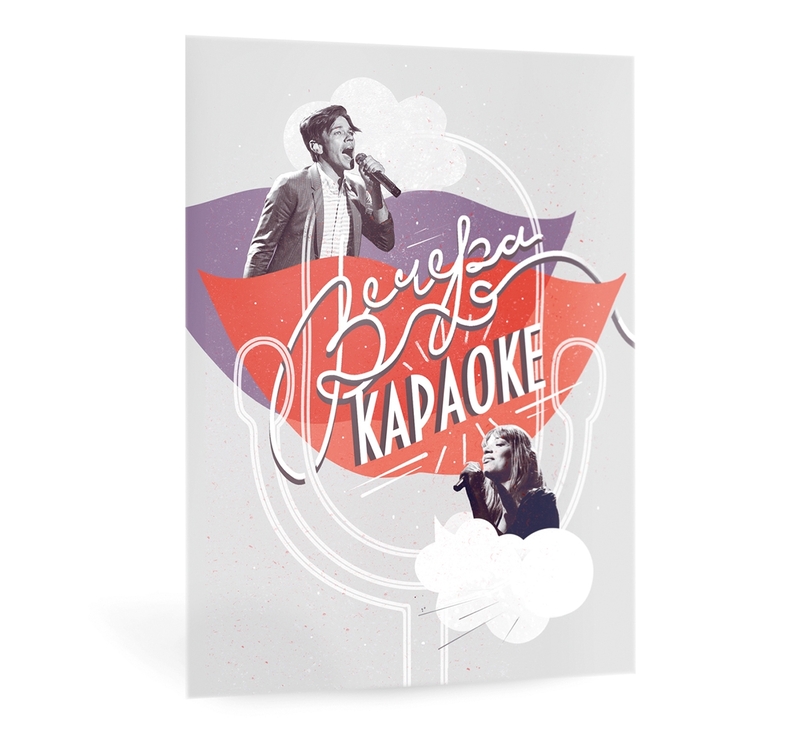 This fun karaoke poster serves up a singing competition aesthetic but is still perfect for karaoke night events. This dominantly uses typography as its primary design element which then results in a light effect when the design elements are summed up. It also uses texture breaking from the flatness by adding depth and dimension. 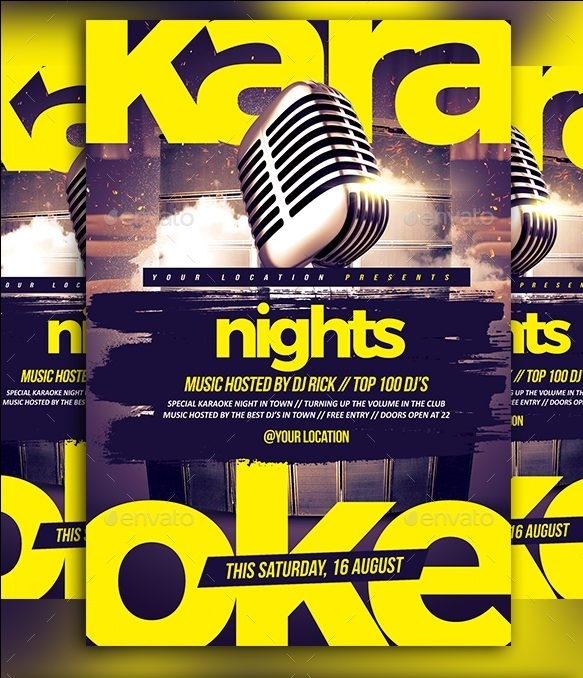 This karaoke night flyer design uses a subtle color palette to bring out the textures in the graphics. This also creates an exciting tone. It’s composition is neatly organized, giving the viewers a straight up-to-down direction in terms of where the other elements are placed. On the flip side, the flyer design comes along with three background variations, all easily customizable and are of 300 DPI high-resolution. 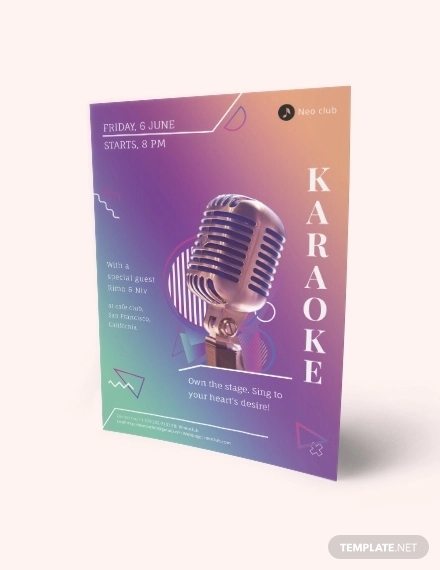 If you are looking for a fun and exciting karaoke night flyer, then this is the perfect pick for you. It is dynamic in its design in terms of the elements; as if it were popping out of their placements. 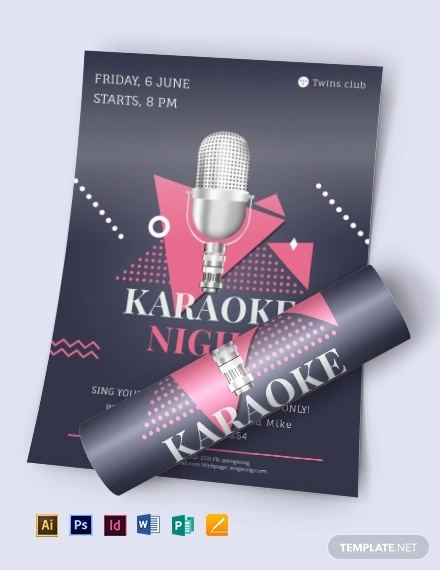 The design and technical elements are composed to fill in the border and to bring emphasis to the karaoke night conditions which is the entry fee. Speaking of the entry fee, its placement gives the viewer’s a slanted point of view. It is available in three color variations for a wide selection. 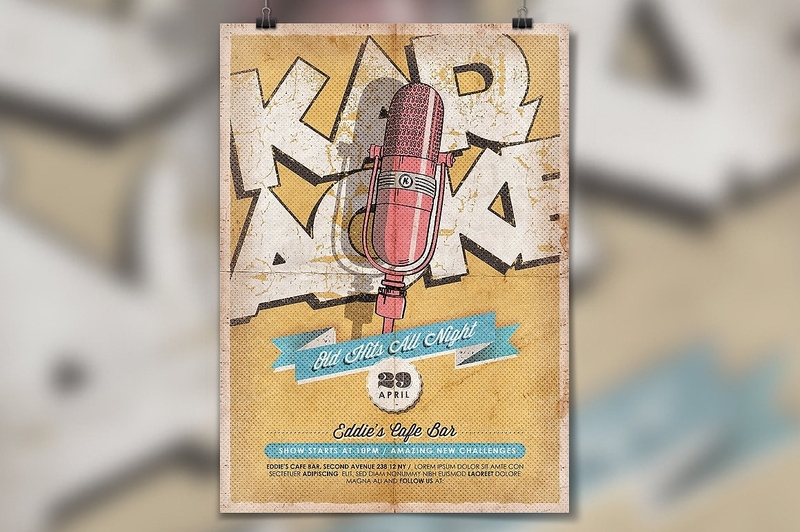 If you are looking for a vintage design style, then this 50’s vibe for a flyer is one design to consider. It brings about this movie theater exterior and is paired with a delicate script to contrast the three-dimensional and bulky weight of the karaoke text. It also brings a luminous shine to a medium lit text. The design also displays a well-organized feel which is inviting to potential guests, knowing that this event is planned for them. 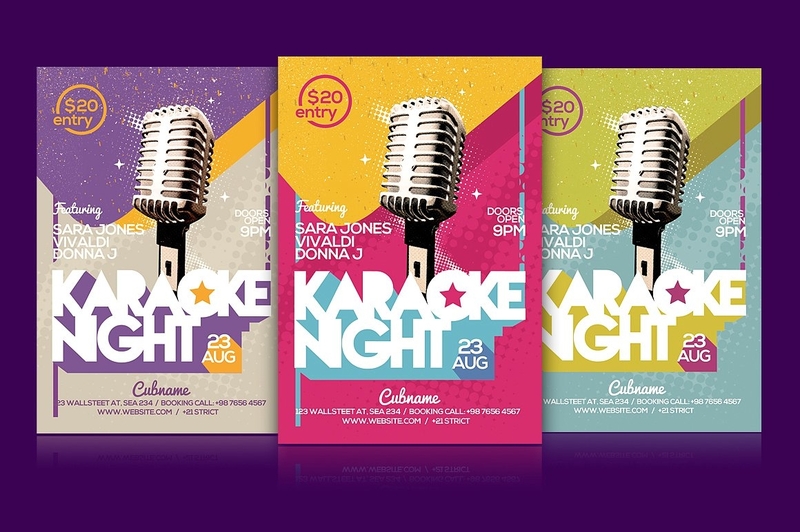 This is one catchy karaoke night flyer for its use of complementary colors. The color shades create a cohesive design without it having to clash or overpower with the other design elements. This uses a human subject which suggests invitation as well as the stage presentation. It is a simple composition and all the necessary event details are included. Having a retro design style with added textures brings about the event theme of Old Hits, All Night. It uses a big type layout which emphasizes the event, grabbing the viewer’s attention and eventually directing the point of view down immediately to the other event’s technical elements and details. Above is another flyer that uses a big type layout. It is more direct and eye-grabbing, whether the viewer is close to or far from the actual advertising medium. 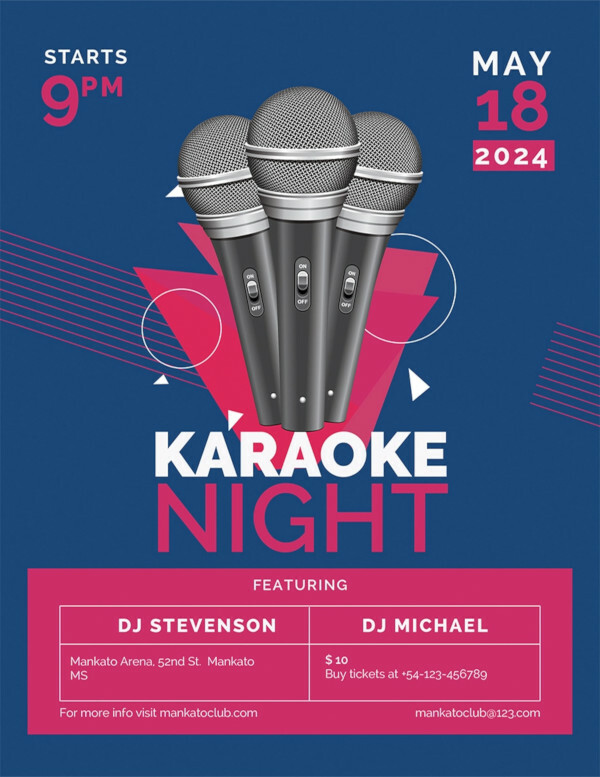 The clever part of this flyer is that the karaoke text is broken down into two parts. This layout has a continuous composition of event details, such as the date for a fast imprint on the event detail, continuing up to the rest of the event’s information. This retro poster design has been laid out in an orderly manner and has enough space for the technical elements to be placed and adjusted. It has less movement in terms of the order and delicateness in the composition of the design elements because of the border. It gives the design a cohesiveness with its monotone color palette and complementing secondary colors for its text. 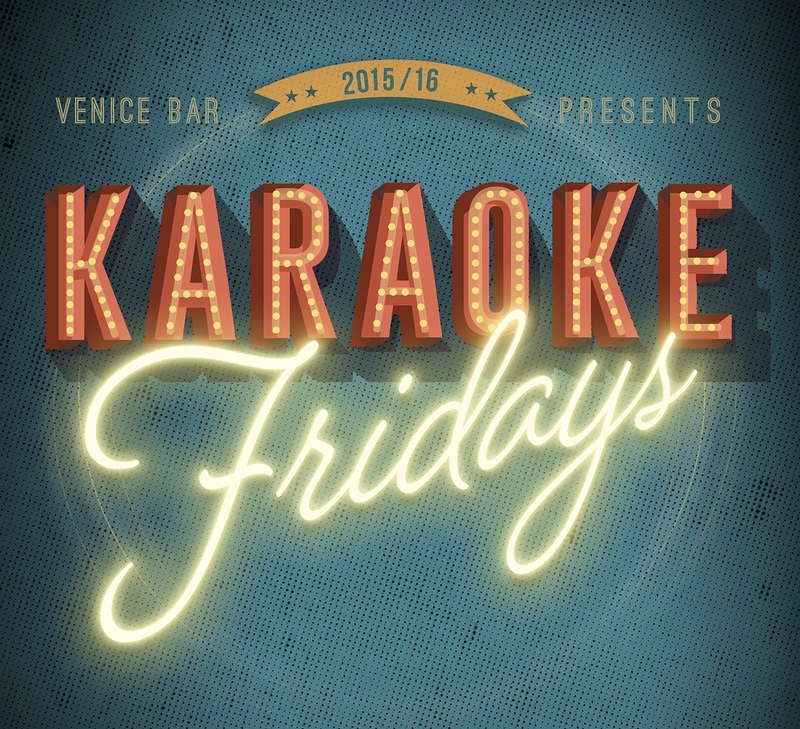 Who says graphics are only used for karaoke night flyers when you can incorporate imagery into the design? The use of a monochromatic color scheme highlights and places the logo as the centerpiece of the flyer design. Even if there is a focal point, you are still meant to look at the details as well. It incorporates a simple layout, dominant use of typography, and direct messaging. You may also go through our collection of night life flyers that are for events, promotional purposes, invitations, and so on. It may also be utilized for future references as well.